The Fargo HDP5000 ID Card Printer is your answer to ID cards that feature high definition, vivid colors, and crisp images. If it’s important to project a professional image with high definition image quality that looks more like a sharp glossy photo, then the Fargo HDP5000 ID Card Printer is your best option. 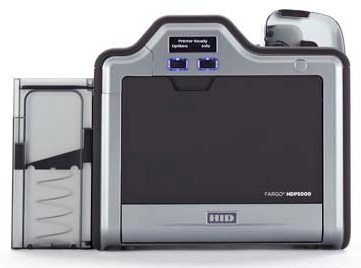 The secret to its success is the Fargo HDP5000 ID Card Printer prints on film instead of directly on the card. This means that uneven surfaces won’t compromise your card’s image quality. The Fargo HDP5000 prints up to the edge of smart chip contacts and over the edge of the card. Since the HDP5000 prints on a film, its printhead never comes in contact with card surfaces or debris. This means the Fargo HDP5000 never gets damaged during the printing process. In fact, it comes with a lifetime warranty. The Fargo HEP5000 takes simple operation to the next level with only minimal training needed. Cards, ribbons, and overlamintes load in a snap, literally, by the cartridge-based system. Faster printing, combined with a dual card input hopper for multiple card types means you spend less time on the biggest production jobs. Thanks to the printer’s ethernet port and internal print server options, you can connect your HDP5000 to your network and print at multiple locations. Or if you’re a university or corporate campus, you can have an array of printer/encoders for high-volume production. Whatever your needs, the Fargo HDP5000 delivers. Fast.